Kijojo.com infection can be classified as a browser hijacker that will alter all of your favorite web browsers’ homepages and default search providers. The threat will change the settings of Google Chrome, Internet Explorer, and Mozilla Firefox. Once Kijojo.com gets into your computer, you will find many undesirable modifications. Any browser hijacker is a serious computer threat; hence, we advise you to remove Kijojo.com as soon as possible. 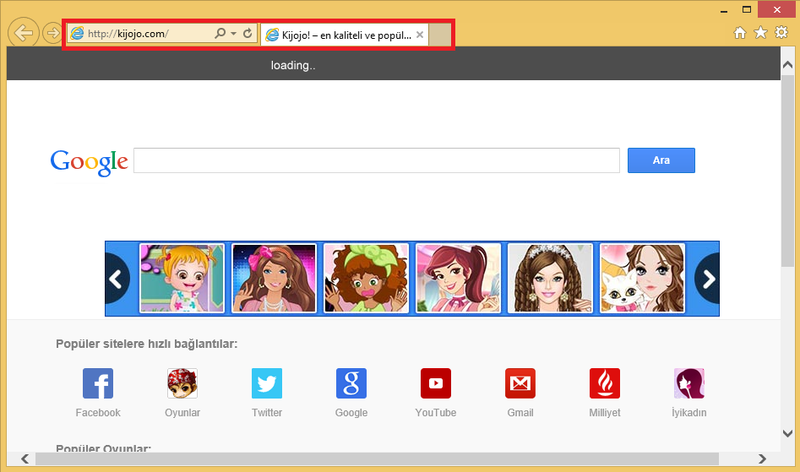 Computer users from Turkey are the main target of Kijojo.com. However, the PC users living in different countries should be aware of this hijacker as well. Kijojo.com might seem as a reputable search engine because it uses the results from Google.com. However, you should not be tricked by this infections. The search results may be easily infiltrated with ads. This commercial material may easily lead you to the dark side of the Internet. As soon as you are there, your PC’s security may become more vulnerable than ever. In order to protect your computer from serious malicious software, you should take care of Kijojo.com removal. How can Kijojo.com hijack your computer’s system? The majority of PC users notice Kijojo.com right away. However, that does not mean that they know how the hijacker has managed to reach their computers’ systems. Kijojo.com uses unfair disperse methods in order to infiltrate as many computers as possible. The main distribution way is via free of charge software bundles. This type of software you can usually find in the unknown pages. Hence, you should at least try to avoid such websites and only download programs from their official sites. Also, pay more attention to the setup process. In most cases, you can deselect the unwanted software there. However, if the browser hijacker has already found a way to your virtual machine, you will need to remove Kijojo.com once and for all. How to delete Kijojo.com from your computer? You can terminate Kijojo.com either manually or automatically. The manual removal method is not an easy one. Especially because the hijacker changes the Target line of the web browsers. In addition, Kijojo.com does not travel alone; hence, there may be more suspicious programs in your computer already. Kijojo.com will check whether you have changed your homepage or not. Therefore, you will not be able to select your preferred web browsers’ settings as long as the program is in your computer. The hijacker will reset your homepage each time you will try to change it. Hence, it is quite the challenge to fix your computer manually. However, you should wait no further and uninstall Kijojo.com before the infection has caused even more problems. Kijojo.com infection can be also eliminated automatically. You will only need to invest in a reputable malware removal software – Wipersoft. This software will take care of all the work for you. By keeping your anti-spyware software up to date, you will not have to face similar problems ever again.